Honestly, I wasn't sure what I wanted to say after reading A New American Tea Party . I don't really want to get into political discussions here. I'm hemming and hawing a little bit even as I type. This isn't exactly Anne of Green Gables. My readership doesn't exactly come here to argue ideology, even though we all might do it if we were "real life" friends (then again, maybe not). But then I thought to myself, "Helllooo, Carrie. This is your blog. If you want to talk about it - you are free to do so. It's a free country after all, heh heh...."
So here I am! 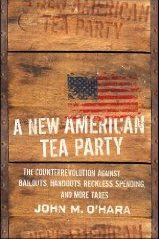 I just finished reading A New American Tea Party , by John M. O'Hara and I have to say I enjoyed it. Why did I enjoy it? I don't think you'd be shocked to know that I'm politically conservative. A glance at my bookshelves, virtual or otherwise, should have clued you in a little as to my leanings. I definitely have opinions about The Way Things Outta Be. What I appreciated most about this book was that O'Hara shares my sentiments. (Because otherwise I would have troubles with it, naturally.) He has a vision and an ideal that he holds to and it's not about any individual person but a belief system. He's not out to attack people or even either of the two main political parties. As he says "there is plenty of guilt to go around" so why pin it all on the liberals, or attack conservatives just to give an appearance of balance? We can share a little here and there! O'Hara just wants to speak his mind and if it offends Al Gore or George W., he's not too particular. That said, as much as I just made him sound so, he's not obnoxious either. He's just talking. You have probably heard about the Tea Parties which have been held around the country in response to the bailouts, threat of more bailouts, and a national health care system. O'Hara was a "founding member" of the tea party movement, I guess you could say. This book was written merely to explain what the grassroots movement was all about - how it got started, what got the ball rolling, and what their purpose is. At the beginning of the book he explains how the first tea party rally came to be. The middle section of the book explains why people who would be inclined to participate in the tea parties would do so (i.e., he "talks politics"). He concludes the book by clearing the air against any misconceptions that you might have about this movement, further explaining what their core belief is. O'Hara explains that the movement never sought out leaders from either political party to represent them when they first got started. When they organized their first big rally in Chicago they were contacted by some lead Republican politicians - including the head of the GOP! - who they ultimately turned away. They didn't want to be spoken to by politicians. Rather, he explains, they wanted the opportunity to speak to politicians. After all, O'Hara argues, the guys in Washington are working for us. They should hear what we have to think and say and then carry out our wishes. That's what we voted them in to do. The movement is not meant to be violent, angry or bitter. It is clear that at times some of the rhetoric has been so, but I would think if we're being honest, the rhetoric in any political group can at times become less than polite. Usually we have a few specific individuals to thank for "spouting off" and it would be hard to judge an entire political group based on the actions or statements of a select few. Rather, O'Hara explains, that their purpose was to organize peaceful rallies in which they could (and can) make sure their voices are being heard in the midst of a great throng of others - asking for government officials to justify both their cutbacks and their spending. This all seems very reasonable to me. "These individuals, on the whole, subscribe to a live-and-let-live philosophy. They believe in free markets and small government. They are Democrats, Republicans, Libertarians, independents, and everything in between. While their opinions on gay marriage, foreign military intervention, or the legalization of drugs may differ, they agree that government is not always the answer. They want to be free to start an honest business, take home most of their paycheck, school their kids how they please, drive an SUV if they so choose, enjoy an adult beverage or even (gasp) the leisure of a tobacco product. I am a conservative. I am not for big government. I am totally against having my taxes raised for one more reason. I think that politicians should learn how to spend the money that they have. I feel capable of doing the same thing for myself. I believe I have a brain that can function to the degree necessary to care for myself, my family and my future, I don't need the government to take my money away and mismanage it as a personal "favor" to me. Therefore I think it's pretty safe for you to assume that I didn't have any major qualms with the arguments O'Hara makes for (and against) government spending in A New American Tea Party . At the same time, this book is definitely not going to be for everyone and the very existence of it will make some people livid with rage. If they ARE enraged I would just be tempted to remind them that we are in America and there is still a right to free speech. Which is why I'm already bracing myself for negative comments on this blog post. Just a reminder - free speech can still be polite speech. I'm just reviewing a book here, folks! Since I'm not currently living in a very conservative state, I was kinda curious to learn more about the tea party movement and was glad for the information provided in A New American Tea Party . It was helpful to me, as an "outsider" to understand where the group was coming from and what they are basing their enthusiasm on, so to speak. I'm curious to know if you think there is a place for such a book that explains the core beliefs of a politically-based group that you may or may not agree with, more than I'm curious to know your opinion of the Tea Parties themselves. Certainly it is an interesting topic and relevant to us, as Americans, today. I think it behooves us to have an understanding of where our country is at, politically, and to be informed citizens. At the same time, I know the topic of politics can be wearisome and so we have to strike our balance as individuals. For my part, I really enjoyed learning more about the tea parties by going to the source, instead of just relying on the media for my "facts". This was helpful to that end and so I'm grateful for it. Thank you, Wiley publishing for sending me this book and providing me with some food for thought! Interesting, I wondered what started the Tea Parties, there was one in the last town we lived in and I loved how many people from different walks of life were gathered together there, ranchers, farmers, gamblers, gamers, tattoo artists, goat dairy owners.... all with so many different views and beliefs, and yet they were all gathered together for one cause; WE THE PEOPLE. The people decide, not the government, not the president. The people are the power, it's what our country has been about and should be about. Thank you for the review, I will have to keep my eye open for that book. Nicely expressed. It's exciting to see people reading history, doing their own homework, and as you say, not simply relying on the media. Thank you for voicing your opinions and reviewing the book. Yes, we can share our opinions, and sometimes we need to. Thank you again! This book sounds very intersting. I really like how you expressed your feelings about the book and what the book is about. My interest in reading this book has most definitly been sparked.